"VENT" MINIPLEAT filters are manufactured from continuous length superior quality micro glass fiber paper media available in various efficiency grades. The filter media is moisture resistant and fire retardant. Anti-microbial treated papers are also available for special applications. Frame Material: Aluminium, MS, Stainless Steel, G.I. - Widely used where high level of purity is required. - Designed for low turbulence displacement flow for clean workbenches and clean room ceilings. 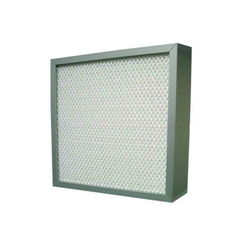 HEPA filters are what trap small particles like PM 2.5, and they’re not expensive! The company manufactures Mini Pleat Filters with large surface area, which are used where higher volume of air with lower pressure loss is to be handled than the HEPA filters. 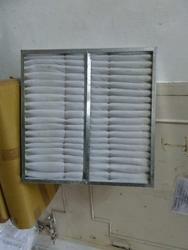 Mini pleat filters are manufactured with sub micro-glass paper. Filter Media: Synthetic fiber media. Frame Material: Stainless Steel, Aluminium, G.I. To meet variegated demands of our esteemed clients, we are engaged in manufacturing a wide range of Mini Pleat HEPA Filter. PRICING mainly depends on size. - Air filtration of 0. 1p to 0.3p particles. - Secondary filtration for class 10 or better clean room.